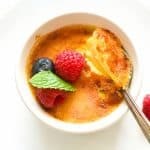 Creme Brulee Recipe – a popular dessert of French origin with a sweet, rich, custard base then topped with a caramelized sugar ceiling. It’s sooo easy to make and you only need 6 ingredients to make this smooth and decadent luxurious dessert! I have so much fun memories making Creme Brulee with mom and my siblings back at home. Even today, I still make one from time to time especially when I feel like having restaurant-like dinner date night at home. And it doesn’t disappoint! You don’t have to pay a hefty amount for this luxurious dessert ’cause you only need 6 ingredients (YES!) 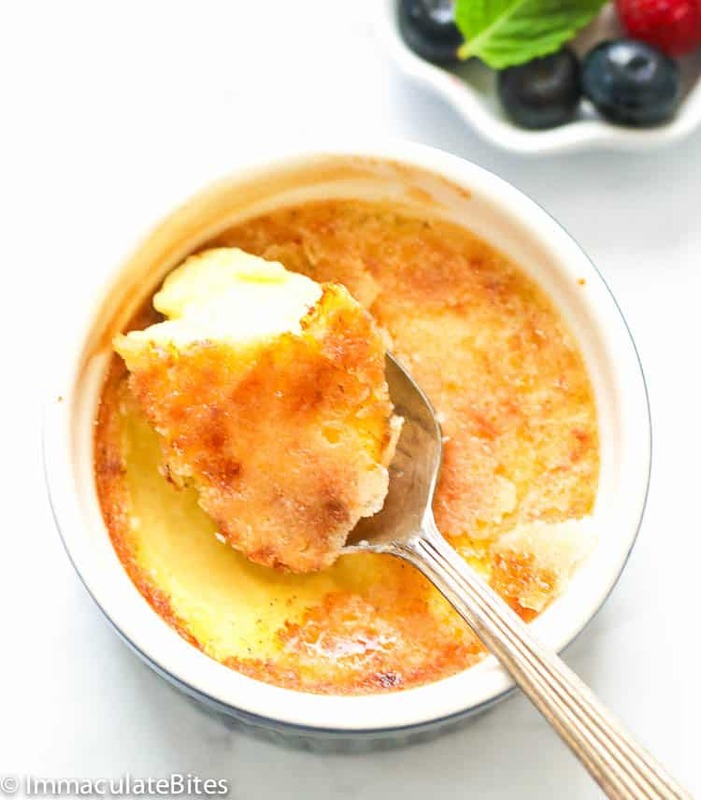 to whip up something as decadent as this Creme Brulee recipe! 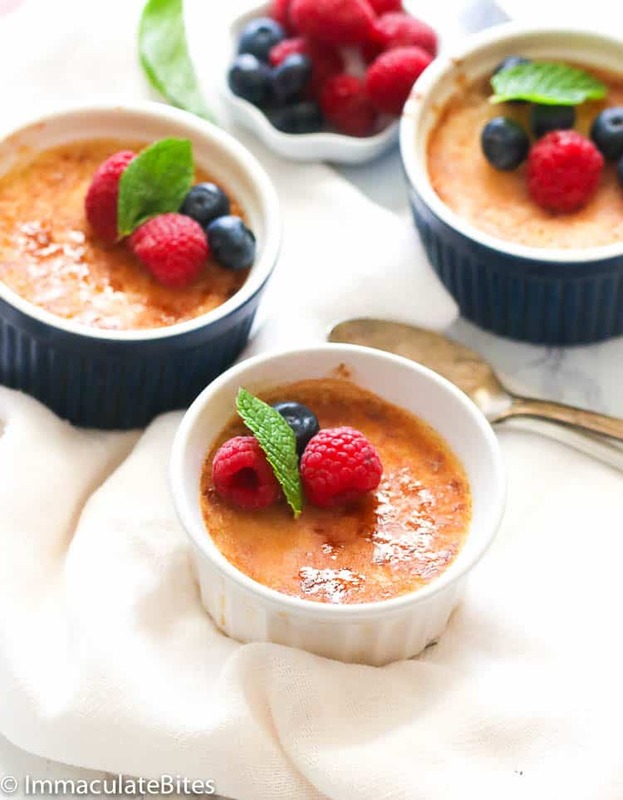 Creme Brulee which means “burnt cream” in French is a dessert with a custard base and topped with a layer of hardened caramelized sugar usually served in individual ramekins. It is primarily made with heavy cream, vanilla bean, egg yolks and sugar. 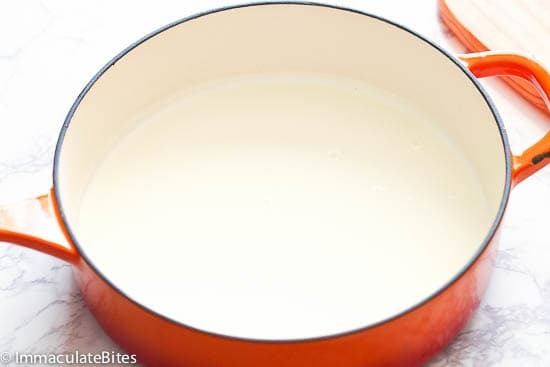 The hardened layer could be prepared separately and topped just before serving or can be formed directly on top of the custard through broiling or torching. It could come in different flavors, with vanilla being the most popular one. 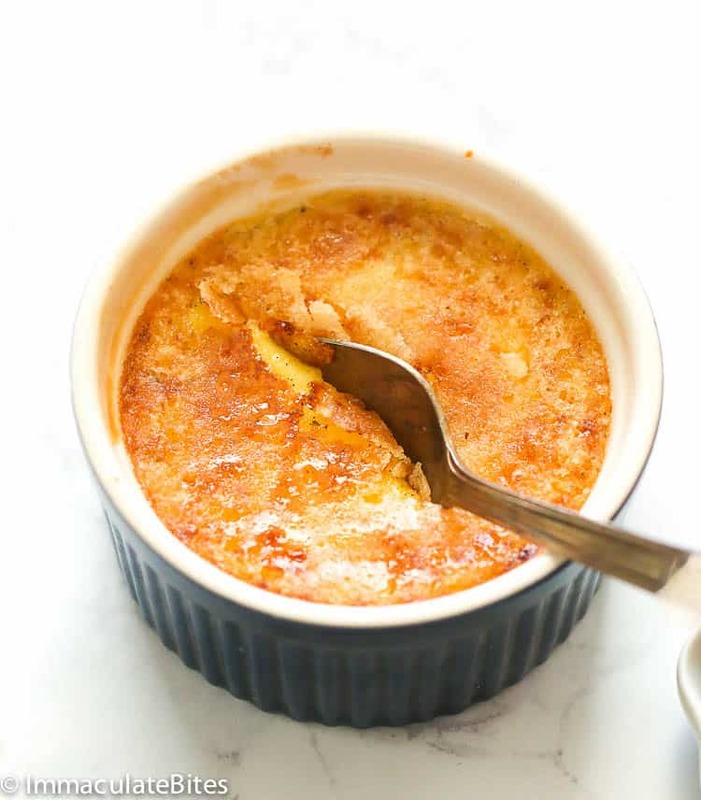 Creme Brulee is one of those decadent naturally gluten-free desserts. Yaaay! This recipe calls for heavy whipping cream, whole milk, vanilla bena, egg yolks and sugar which are all right in the gluten-free list. In short, if you’re following a strict gluten-free diet, this one’s a must-have every now and then or when your sweet tooth craving kicks in. And now you’re asking is heavy whipping cream the same as the heavy cream? Sort of. In fact, both taste good and are gluten-free except that heavy cream (38% fat) has a higher fat content compared to whipping cream (35% fat). That means that they hold their shape well. Those two are equally important to my life! I love love creme brulee and flan. I mean, who doesn’t? They are both heavenly treats and a delight to your mouth. But is there a difference between the two? Dessert custards share the same thing: rich, smooth and silky in texture and luxurious in every bit. Flan, also known as creme caramel, has more or less the same ingredients with creme brulee. The thing that separates them is the sugar topping. 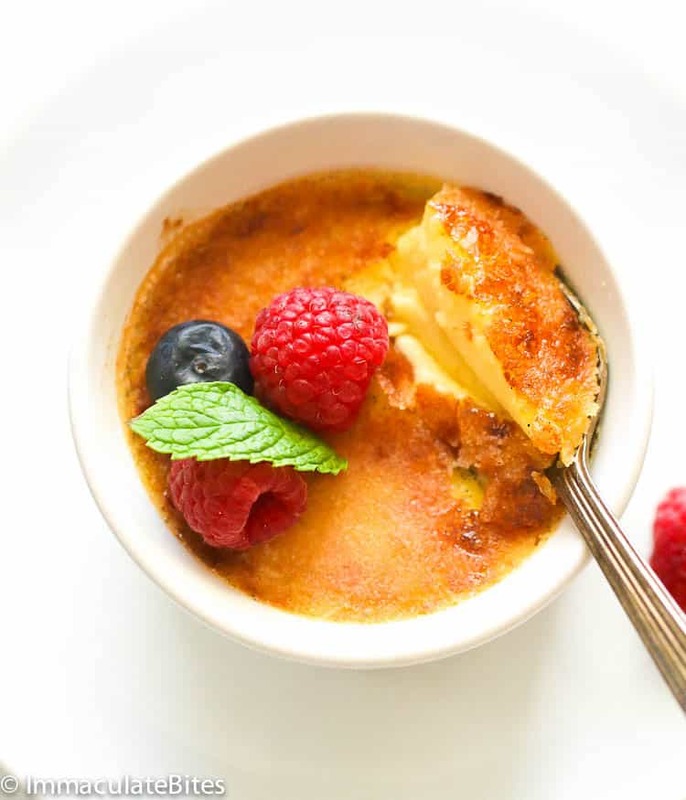 In a creme brulee, sugar is either torched or broiled to form a hard caramel crust on top of the custard. A Flan on the other hand is baked or steamed in a caramel-sauce-lined ramekin that covers the flan on top when flipped. In conclusion, creme bruless has a crusty caramelized sugar top while a flan has a saucy, caramelized sugar top coating. 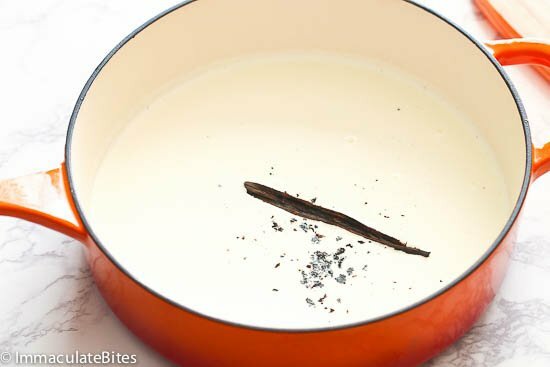 While I do love the vanilla flavor in a creme brulee, you can actually easily add your favorite flavor to its custard. You can add an espresso into it, lemon for a fresh spin, red wine for bold rich flavor, chai-tea for all tea lovers out there, chocolate, coconut and more. You can check other creme brulee flavors HERE. Chill it first before serving and top it with berries for a beautiful presentation. A word of advice though, make sure you have to have someone accompany you while making this. Or you’ll end up eating the whole batch without realizing it. Preheat oven to 325 degrees F and bring about 3-4 cups of water to a boil on a stovetop. Prepare ahead the ramekins and place them in a roasting pan or a baking pan. 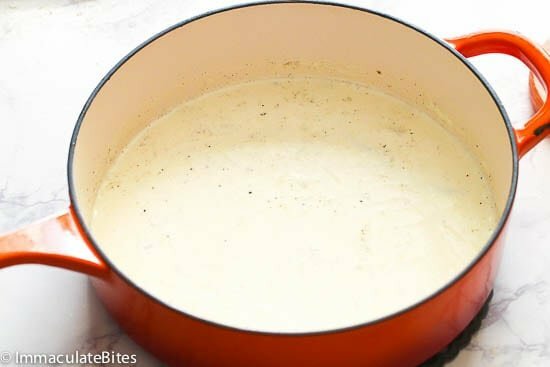 On another Dutch oven or medium saucepan, heat heavy whipping cream and whole milk on a medium heat. Then add vanilla bean or extract once it starts to simmer. Give it a quick stir and simmer for another 5-7 minutes. Remove from heat and set aside. In a large bowl, add in egg yolks followed by the sugar. Whisk until fully combined. Slowly and steadily pour in the milk mixture 1 cup at a time into the egg combination while whisking in between to fully incorporate. Carefully transfer and divide the custard mixture into each ramekins. Then pour in the hot water into the hot pan and around the ramekins making sure not to splash any water into the ramekins. Place them in the oven and bake for 35- 40 minutes or until the edges are set and centers are less jiggly. The depth of your ramekins would also determine how long to bake the custard mixture. As a rule, bake custard that are less than 1 inch deep and in and those in shallow dishes around 30 minutes. For narrow and taller custard that are 2-inches deep, bake them around 50 minutes to an hour. Using a tong, remove the creme brulees from the baking dish. Place on a wire rack to cool for 5 minutes and refrigerate for at least 30 minutes before serving. When ready to serve, take out the ramekins from the fridge and dab the tops with the turbinado sugar and caramelize them using a kitchen torch or broil for 5-10 minutes while rotating them frequently for even cooking. Take them off from the oven when it’s already brown and bubbling. Serve right away after or let it sit again the fridge for an hour before serving. Top it with berries, if desired. Then add vanilla bean or extract once it starts to simmer. Give it a quick stir and simmer for another 5-7 minutes. Remove from heat and set aside. In a large bowl, add in egg yolks followed by the sugar. Whisk until fully combined. 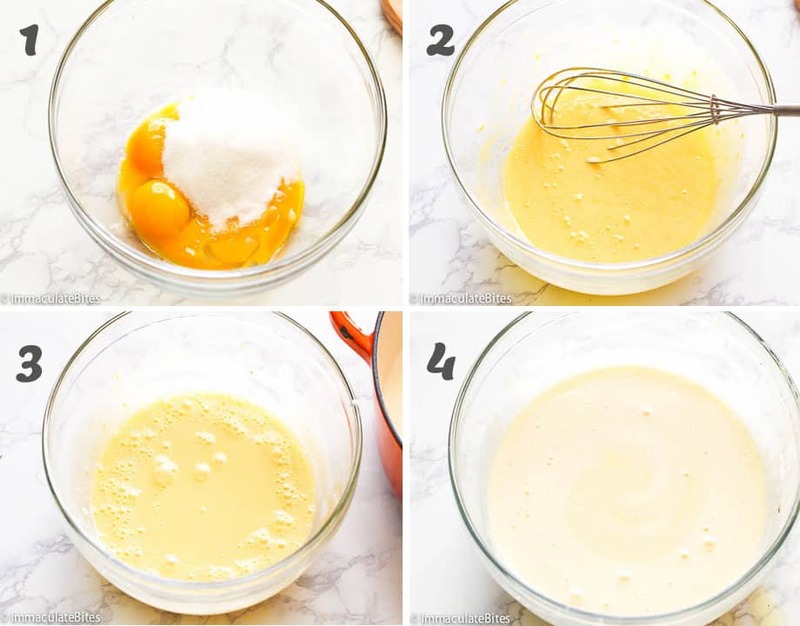 Slowly and steadily pour in the milk mixture 1 cup at a time into the egg combination while whisking in between to fully incorporate. Carefully transfer and divide the custard mixture into each ramekins. Then pour in the hot water into the hot pan and around the ramekins making sure not to splash any water into the ramekins. Place them in the oven and bake for 35- 40 minutes or until the edges are set and centers are less jiggly. Note: The depth f your ramekins would also determine how long to bake the custard mixture. As a rule, bake custard that are less than 1 inch deep and in and those in shallow dishes around 30 minutes. For narrow and taller custard that are 2-inches deep, bake them around 50 minutes to an hour. Using a tong, remove the creme brulees from the baking dish. Place on a wire rack to cool for 5 minutes and refrigerate for at least 30 minutes before serving. When ready to serve, take out the ramekins from the fridge and dab the tops with the turbinado sugar and caramelize them using a kitchen torch or broil for 5-10 minutes while rotating them frequently for even cooking. Take them off from the oven when it’s already brown and bubbling. Serve right away after or let it sit again the fridge for an hour before serving. Top it with berries, if desired. Just found this wonderful website and I am so excited to see such enticing recipes. I love the wholesomeness of these recipes. Plan on getting ingredients super soon to make several of these. Some of the African recipes sound so delicious and unique. So happy I found this site. So happy to have you hear on board Cecilia. Do let me know which ones to try out. Love Creme Brûlée. Does the mixture need to be strained? I love your recipes and direction and the notes. Keep them coming. Thanks !No it doesn’t have to be strained. Looks so delicious. Thank you for sharing your amazing recipes. Hi Maureen,So happy to hear it’s working out for you.